Gastric Bypass vs. Duodenal Switch: Which is Best? Expected Weight-Loss? Both duodenal switch and gastric bypass surgeries are weight loss surgeries that have been shown by different studies to be effective in morbidly obese individuals in achieving weight loss and resolution of the disease conditions that are associated with obesity. Gastric bypass surgery used to be the most commonly performed weight loss surgery in the United States but has now been overcome by gastric sleeve surgery. Duodenal switch, on the other hand, is mostly reserved for super obese individuals (BMI≥ 50kg/m2) or as a revision surgery following the failure of other weight loss surgeries. 4 intestine from the new stomach. 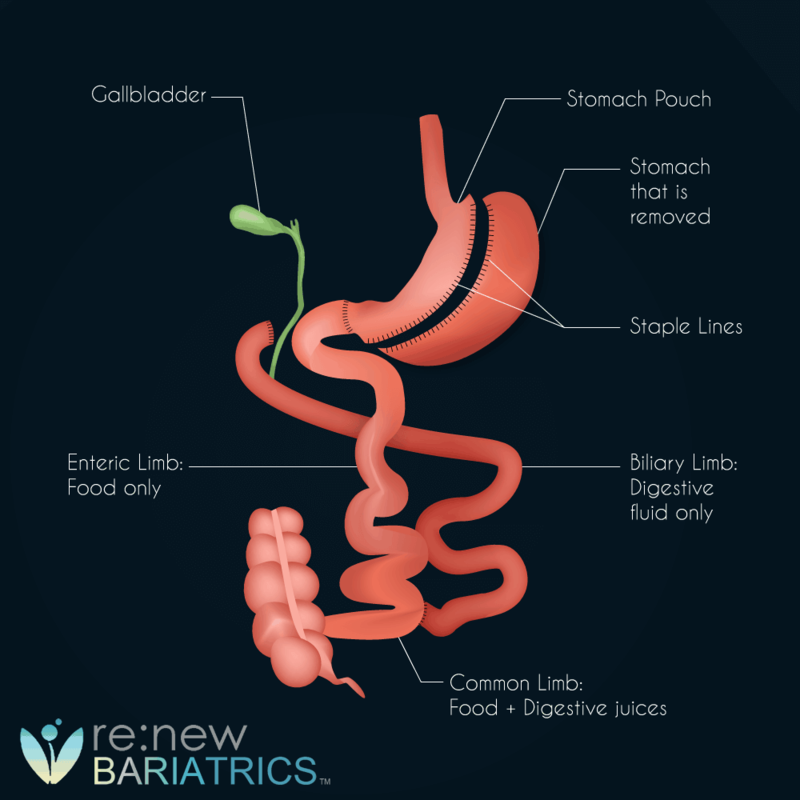 Renew Bariatrics recommends Gastric Bypass Surgery for a majority of reasons, primarily that it provides very high expected weight and reduction in comorbidities. Duodenal Switch (DS) is not as well-researched as Gastric Bypass Surgery (RNY); which can promote unexpected outcomes. DS also promotes extreme weight-loss, which can cause serious health issues. Interested in Gastric Bypass Surgery in Mexico? Learn more about undergoing Gastric Bypass in Tijuana or Cancun, Mexico now. Call us today! Both duodenal switch and gastric bypass combine restrictive and malabsorptive mechanisms to induce weight loss. In the case of Roux-en-Y gastric bypass, a small pouch is created from the upper part of the stomach; this serves as the new stomach. The small intestine is then divided at about 45cm from the stomach, and the lower end is joined to the new stomach while the upper end is joined to the intestine at about 100cm from the point of division. intestine from the new stomach. 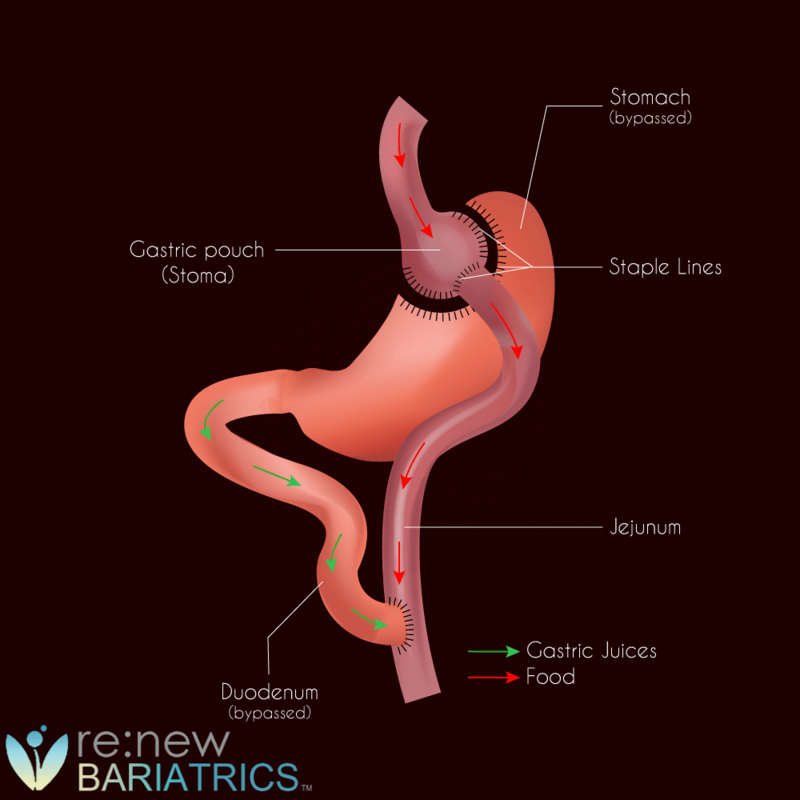 In a duodenal switch, the capacity of the stomach is also reduced by a gastric sleeve surgery. The intestine is then refashioned in such a way as to prevent the bile and pancreatic enzymes from coming in contact with the food until about 50cm from the junction between the small and the large intestine. This is achieved by dividing the duodenum (1st part of the small intestine). The lower end of the gap is closed and turned to a blind end. The small intestine is again divided at the about 250cm from where it joined the large intestine. The upper end is joined to the small intestine at about 50cm from where it entered the large intestine. The lower end is joined to the upper end of the first point of division. With this arrangement, absorption will not take place in a relatively longer part of the intestine than what obtains in gastric bypass. Both gastric bypass and duodenal switch can be done by open surgery or laparoscopic approach. The laparoscopic approach is favored as it reduces the perioperative complications. The operative duration of the duodenal switch is longer than that of gastric bypass surgery with a difference of up to an hour. Patients also stay more in the hospital after duodenal switch than after gastric bypass with a difference of about one day. Duodenal switch is costlier than gastric bypass. Although cost varies by countries and hospitals, the average cost of the duodenal switch in the U.S. is $25,000 ($23,000-$34,000) while that of gastric bypass surgery is $21,000 ($17,000-$30,000). While most insurance policies cover gastric bypass surgery, only a few companies provide coverage for duodenal switch. The percentage of excess weight loss after gastric bypass surgery is lesser than that of duodenal switch. Rabkin reported percentage excess weight loss of 78% vs. 74% in favor of the duodenal switch. On an average, the patient can lose about 78% of the excess weight by 18months of the duodenal switch and about 70% of the excess weight after gastric bypass surgery. Patients also experience a higher percentage of total body weight loss after duodenal switch than after gastric bypass surgery. In the work of Mingrone et al., a remission of type 2 diabetes mellitus was reported in 95% and 75% of patients after the duodenal switch and gastric bypass respectively at 2years post-surgery. A higher percentage of resolution of other comorbid conditions in favor of duodenal switch has also been reported by various studies. Duodenal switch is associated with more complications and a higher risk of death than gastric bypass surgery. However, almost all complications that can be seen with the duodenal switch can also occur after gastric bypass surgery (except for heartburn from GERD). Nutritional deficiency is more severe with duodenal switch. Also, complications such as deep vein thrombosis (clotting of blood in the leg veins) and pulmonary embolism (obstruction of the blood vessels in the lungs by a blood clot) are commoner with duodenal switch. In conclusion, duodenal switch and gastric bypass are weight loss surgeries that combine both restrictive and malabsorptive mechanisms to induce weight loss. Both have almost the same types of complications. However, the risk is higher after duodenal switch. While gastric bypass is cheaper and safer, duodenal switch achieves more weight loss and reversal of comorbid conditions. Bennett JMH, Mehta S, Rhodes M. Surgery for morbid obesity. Postgraduate Medical Journal. 2007;83(975):8-15. doi:10.1136/pgmj.2006.048868. Prachand VN, DaVee RT, Alverdy JC. Duodenal Switch Provides Superior Weight Loss in the Super-Obese (BMI ≥50kg/m2) Compared With Gastric Bypass. Annals of Surgery. 2006;244(4):611-619. doi:10.1097/01.sla.0000239086.30518.2a. Rabkin R. Distal Gastric Bypass/Duodenal Switch Procedure, Roux-en-Y Gastric Bypass and Biliopancreatic Diversion in a Community Practice. Obesity Surgery. 1998;8(1):53-60. doi:10.1381/096089298765555060. Anderson B, Gill RS, de Gara CJ, Karmali S, Gagner M. Biliopancreatic Diversion: The Effectiveness of Duodenal Switch and Its Limitations. Gastroenterology Research and Practice. 2013;2013:974762. doi:10.1155/2013/974762. Contact our helpful patient educators who can help guide you through the entire process of getting approved for the Bariatric Surgery Mexico.